Many people believe that symmetry is beauty. Nature is full of symmetric objects. There are many man-made structures that are also symmetric. In this post, we are going to discuss some of the basic mathematical properties of symmetric objects. We will limit our discussion to line symmetric objects. A figure is line symmetrical when it can be folded along a straight line such that the folded shapes fit exactly on top of each other. The fold line is called the line of symmetry. Note: This is the first part of the the Slope Concept Series. The sequels of this article are Part II – Slope of the Graph of a Linear Function and Part III – Slopes of Vertical and Horizontal Lines. The slope is known to be the steepness of a line. Sometimes it is described as “rise over run,” If we are on point A, we go up 4 units and we go right 5 units (see Figure 1) then our rise is 4 and our run is 5. Let us mark our new location B. Notice that the order of movements does not matter. We can also go 5 units right and 4 units up and you will still be in B (see Figure 2). If we do our movement in the coordinate plane starting from the origin, our rise would be our vertical movement (change of movement with respect to the y-axis) and our run would be our horizontal movement (change of movement with respect to the x-axis). 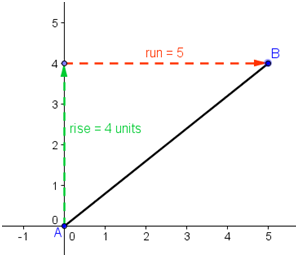 In Figure 2, segment AB has rise 4 and run 5. Thus, the slope of segment AB is . 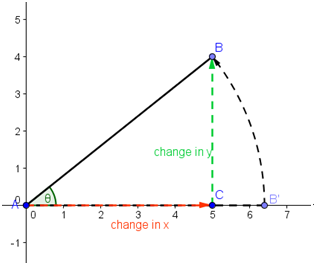 In general, slope in the coordinate plane is described as the change in y over the change in x. Figure 1 - Segment AB with rise 4 units and run 5 units. The slope of a line (or a segment) may also be described as the angle it makes with a horizontal line. Technically speaking, it is a counterclockwise rotation with the line starting from a horizontal position about a point which is located on that line, or the origin our case. In Figure 2, is the angle measure AB makes with the horizontal axis of the rectangular coordinate plane, or the amount of rotation from AB’ to AB about A. Figure 2 - Counter-clockwise rotation of AB to AB' about A. Looking at triangle ABC, since the given sides are the side adjacent and the side opposite to , we can use the definition of tangent to compute for the value of . 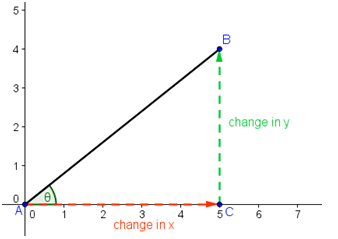 Recall from trigonometry that the definition of a tangent of an angle of a right triangle is equal to the quotient of the length of the side opposite to it (change in y) and the length of the side adjacent to it (change in x). Now, this is precisely the definition of slope. From here, we can conclude that the angle that a line makes with a horizontal line is the same as the slope of that line. As a consequence in radian measure (or approximately 38 degrees) is the slope of the line. Figure 3 - Triangle ABC with Slope 4/5. If we examine the value of , it is clear that when is degrees, the line is horizontal since there is no (zero) change in y. Algebraically, this makes the numerator of the fraction change in y which implies that the slope of any horizontal line is . If the line is vertical, there is no (zero) change in x. That makes the denominator of the fraction change in x . Of course, we know that anything divided by is not defined. As a consequence, slope of a vertical line is undefined. In the continuation of this article, we will discuss further about the properties of slope. We will discuss why the slope of a straight line is constant. We will further discuss zero, undefined, negative and positive slopes. We will also discuss how the concept of slope helps in solving calculus problems and how it is used to determine the behavior functions.